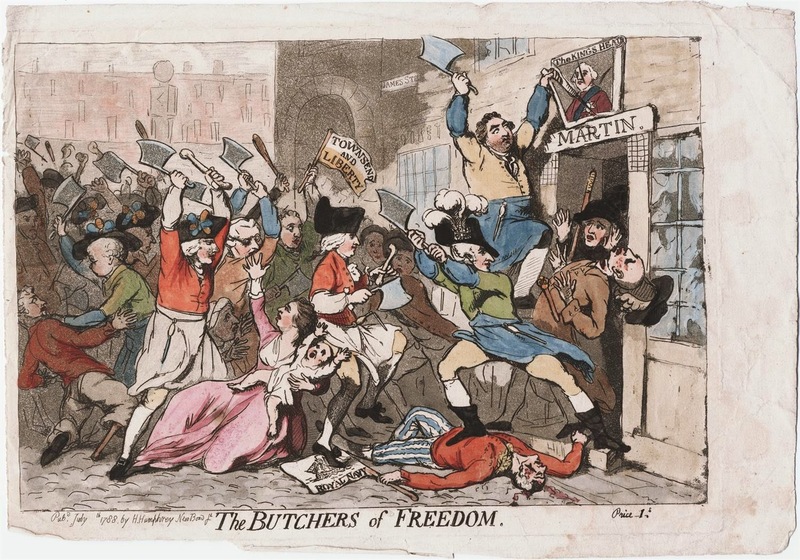 The Butchers of Freedom, H. Humphrey, 1788, Walpole Library. An obese old lady, wearing a flowered dress, is shown seated at a card table. Her hair is piled high and topped by a cap ; a spider dangles behind her. What we see instead is violent political repression. A cleaver wielding mob descends on their opponents, hacking them to bits. At the center right of the image, with his boot pressed into the corpse of a sailor, is George Hanger. His hat is bedecked with three feathers: the symbol of his buddy the Prince of Wales. Hanger is often depicted wearing green, the color of his uniform while serving with the Queen's Rangers in America. Though the image from the Walpole Library does not sow him in this distinctive color, another colored print in the Yale University Digital Collections does. Luckily for us, the dead sailor is also wearing a variant outfit. 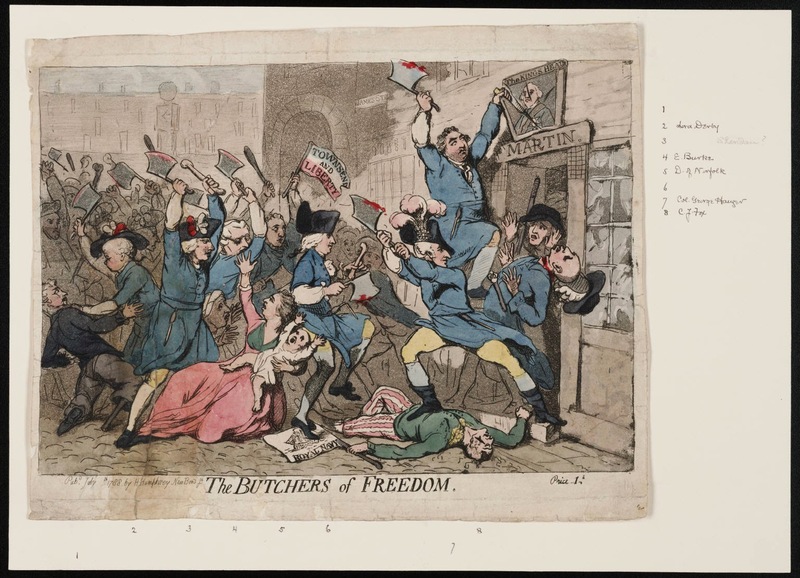 In both images the dead tar wears no hat, and his banner displaying pride in the Royal Navy is trampled by the butchers. His jacket is double breasted with cloth covered buttons and open mariner's cuffs. In the first his jacket is green, in the second it is red. A yellow striped neckcloth is displayed in both. Jack also wears a pair of trousers with broad vertical stripes: red stripes in one, blue stripes in the other.